This text comes from our book, Light to the Nations II: The Making of the Modern World. For more information on Light to the Nations II, go here. To see sample chapters of this book and our other books, go here. For ordering information on Light to the Nations II and our other texts, please click here. The battle that ended Austria-Hungary’s participation in the war occurred on October 23, 1918, when the Italians, with British, French, and American reinforcements, attacked Austrian positions on the Piave River and in the Alps. The stout resistance the Austrians made in the mountains surprised the Italian commander, Armando Diaz. He could make little headway against the Austrian, German, Czech, Slovak, Magyar, Croat, Pole, and Ukrainian soldiers of the Emperor’s army, who disputed every inch of ground with the enemy. Elsewhere, along the Piave, the Italians made more progress, and by October 30 had captured the town of Vittorio Veneto, thus splitting the Austrian army in two. The day before the capture of Vittorio Veneto, Austria and Italy had begun armistice negotiations that resulted in the calling of a truce on November 2. Despite the truce, after the Austrians had laid down their arms, the Italians continued to advance into the mountains of Trentino until they reached the Brenner Pass. When the armistice was finally signed, Italy was occupying lands of “unredeemed Italy” that the Allies had promised her in the secret Treaty of London. The defeat at the Battle of Vittorio Veneto was the death knell of the empire. One by one, each of the outlying regions of the empire, inhabited by Croats, Slovenes, Poles, and Ukrainians, proclaimed their independence. In Hungary, the government collapsed; in Austria, socialists were calling for the overthrow of the monarchy and the establishment of a republic. Though many groups supported the monarchy, all knew what the powerful President Wilson was demanding—the abdication of the Habsburg emperor. Emperor Karl, however, refused to abdicate. He saw his throne as a trust given to him by God, and he would not betray that trust. But, knowing his people would not have peace as long as he remained head of government, he decided not to abdicate, but to step down from power. Karl had not abdicated. He remained Austrian emperor and Hungarian king in the hope that, one day, he could again take up the duty he felt God had laid on him—the duty that had belonged to his Habsburg ancestors for over 600 years. But on the night of November 11, 1918, as the imperial family made its way from the capital to Eckartsau, a family hunting lodge northeast of Vienna, the great Habsburg tradition of rule came to a sad and quiet end. Hunger, sickness, exhaustion. Hundreds of thousands dead or wounded. Hopelessness and anger. Germans were sick of the war. They had been told their sons were shedding their blood to defend the Fatherland. They had been promised glory and a “German peace.” They had been assured that God was with them. But all they had, for all these promises, after four long years was hunger, sickness, exhaustion, and death. On November 1 came the news that the Americans were renewing their push against the German lines on the Western Front—would they be able to break through? Would the Germans at last be forced to retreat to the Rhine? On November 4, socialist-inspired uprisings broke out and spread throughout Germany. The people had had enough of war. They wanted peace, peace at all costs. For Germany to have peace, Kaiser Wilhelm had to abdicate. President Wilson had made that, at least, quite clear. 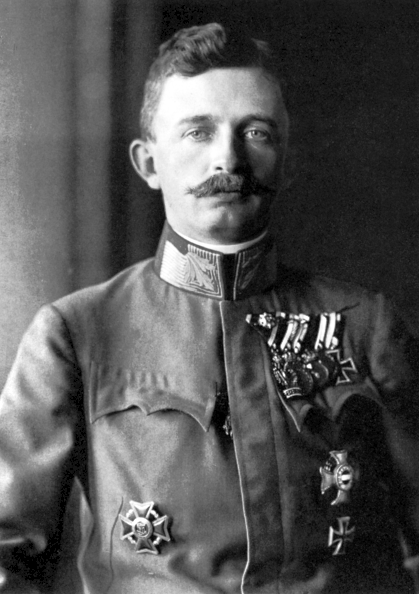 Germany’s chancellor, Prince Max von Baden, urged Wilhelm to give up the throne of Prussia and the empire of Germany. Wilhelm, at the front with his troops, refused. Meanwhile, socialists in the Reichstag were demanding a republic, while the Reich (empire) was collapsing into anarchy. Prince Max was hoping he could form a constitutional monarchy; but, in the end, the decision was not left to him. On November 9, the German socialist politician and member of Prince Max’s cabinet, Philipp Scheidemann, publicly announced the creation of the German republic. The same day, without asking Wilhelm’s permission, Prince Max announced that “the Kaiser and king had decided to renounce the throne.” When the news that he had abdicated reached Wilhelm, he fled to neutral Holland, where he had been offered asylum. So ended the reign in Germany of the House of Hohenzollern. While Austria-Hungary and Germany were casting off their kings and establishing Liberal republican governments, the Allies were planning what they hoped would be their last great offensive. It was planned for November 14 and would include a slamming French and American assault on the German lines as well as a massive airplane bombardment of Berlin. But the attack never came off; for, since November 8, representatives of the Allied and German governments had been discussing terms of peace and had at last come to an agreement. The Germans did not like the terms of the agreement, but they thought they had no choice but to accept them. 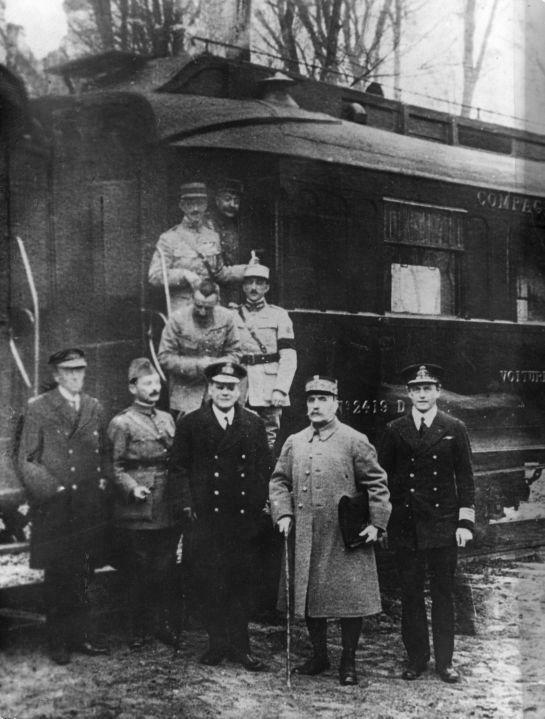 So it was that at 5:00 a.m. on the morning of November 11, 1918—in a railroad carriage in the Forest of Compiegne, 40 miles northeast of Paris—the Germans and Allies signed an armistice. It would go into effect in six hours. At 11:00 a.m. of November 11 (“the eleventh hour of the eleventh day of the eleventh month”), for the first time in four years, the guns fell silent all along the Western Front. The war had ended.